Since September Emirates serves one of three daily flights from Dubai to Frankfurt with Airbus A380 instead of Boeing 777-300ER. Thierry Antinori, Executive Vice President and Chief Commercial Officer, said: “We are proud to fly our A380 to one of the key aviation hubs in Europe. The financial capital of Germany continues to be a significant point for us so it is only fitting for us to operate our flagship product to the city. The 519 seat A380 deployed on the Frankfurt to Dubai route offers 14 Private Suites in First Class, 76 full-flat bed seats in Business Class and 429 seats in Economy Class. Flight EK45 leaves Dubai at 0825hrs and lands at Frankfurt Airport at 1315hrs. 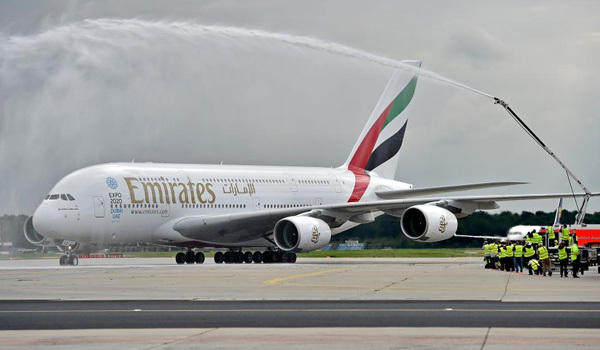 The return flight EK46 departs Frankfurt at 1520hrs and arrives back at Concourse A, the home of the Emirates A380 and the world’s first purpose-built facility for the aircraft at Dubai International Airport at 2335hrs. In Germany Emirates uses its A380 on both daily flights to Munich. To Dusseldorf and Hamburg Emirates flies with Boeing 777. Latests A380 destinations since January are Barcelona, London-Gatwick, Zurich, Kuwait, Mumbai and now Frankfurt. The next one will be Dallas/Fort Worth (October 1st), San Francisco (December 1st) and Houston (December 3rd).